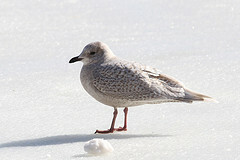 Matthew Ligas reports today: There is a 1st-cycle Iceland/Kumlien's Gull on The Lake now. Seen around 1pm. West side ice near the boat landing around W 75th St. Pictures below. 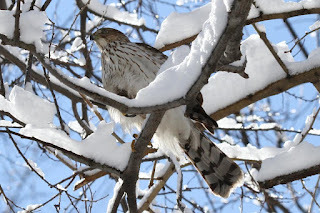 Other highlight while walking around the Ramble was an immature Cooper's Hawk perched for a long time near the feeders. Found by another birder who pointed it out whose name escapes me now - Steve?